Hope you are already aware of iterating over array elements using v-for directive. In our applications, we deal with objects as much as arrays. So, without further ado let’s understand how to iterate over the various properties of an object. I hear you say, “what about an array of objects then?” I got you. We will handle that scenario too! 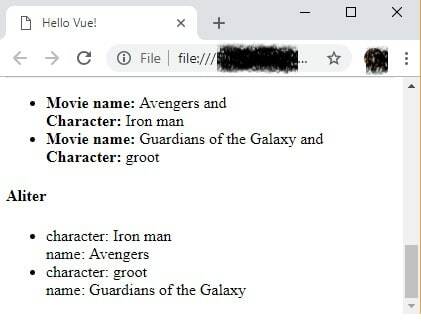 Time to add a simple object to our Vue instance’s data object. 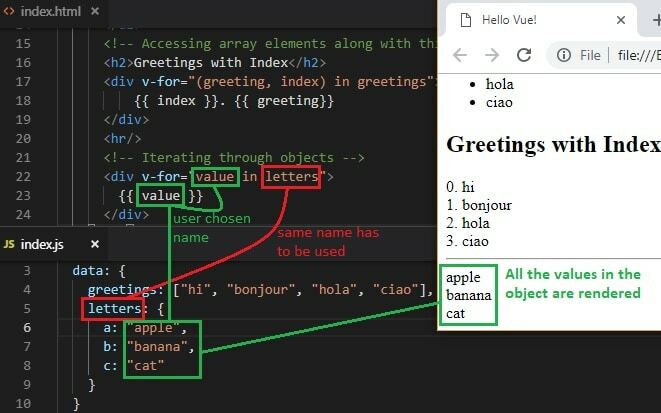 In order to loop over the key-value pairs of an object, we can use the same v-for directive. It is very simple to access the values of an object. Isn’t this syntax very similar to iterating over array values? If we just want to get the value from each key-value pair, then this would suffice. ‘value’ – This can be any name of your choice. Use the same name to access each value. ‘letters’ – This has to be the same object name as in the data object. If we want to have more than one argument in the v-for syntax, then we have to use a parenthesis. The order is important here. The second argument will be the key. The argument names can be anything of our choice. Let us use value and key as argument names for simplicity and easy understanding. A third argument can be used to get the current index of the key-value pair being accessed. Once again, the order of these arguments is important. The first argument will always be the value, the second will be the key and the third, current index. The argument names can be of our choice as always. Don’t forget to enclose all these arguments in parenthesis. For better understanding, let us use ‘k’ for the key, ‘v’ for value and ‘i’ for the current index. Sticky note: It is important to note that the order in which these key-value pairs are displayed, may vary over different browsers. Because the order is based on the results of Object.keys() which returns all the keys of an object. Since the argument names can be anything of our liking, the below code also gives the same results. Let’s say we have an array of two simple objects in our data object. movie.nameand movie.character – gets the values of the keys, name and character respectively, from the individual object currently being looped and saved in the ‘movie’ variable. Remember, in case you don’t want to use the dot operator or render the key-value pairs dynamically then you can nest another v-for directive. Of course, you can nest any number of v-for directives within. Hoping that the name of the movie is unique. This will help Vue to track each node’s identity. If you come across a situation where you just want to print numbers starting from 1 to some fixed integer, then once again, it’s just a cakewalk with Vue’s v-for directive. 3 – range which signifies the last number that will be considered while looping. The outer v-for keeps track of the number of times the code within the <div> tags is repeated and the inner v-for generates a range of integers from 1 to 3. 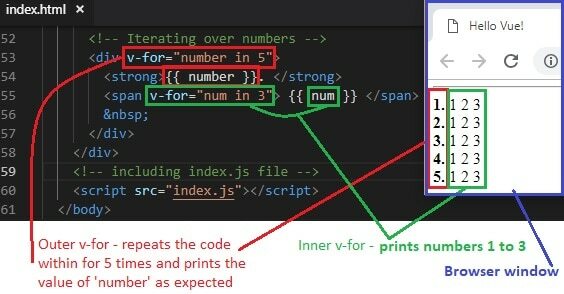 Instead of taking a peek at individual snippets, let us just see the complete code. All the code discussed above is also available in the GitHub repo.